One class I’m particularly excited about is a new one I’m creating called “From Manuscript to Book: How It Happens.” I did a version of it during a May term at Houghton College back in 2009, but I’m refashioning it to fill a full semester. Five local authors have entrusted us with their complete manuscripts (all fiction), and my class will become a publishing company (name to be determined) that will walk these manuscripts through the entire publishing process. My students will work in groups. Each group will receive a manuscript and they’ll first work as content editors. They’ll consider all the things fiction editors have to — pacing and characterization and plot and dialog. We’ll Skype with a fiction editor who will talk us through her process. At the end of the first few weeks, they’ll prepare a detailed letter back to their author with advice for the manuscript. In the meantime, class periods will include a behind-the-scenes look at how a publishing company works. We’ll create schedules and budgets and P&Ls and sales projections. From this information, they’ll also begin a title information sheet. From the title sheet and their P&Ls, they’ll prepare a sales presentation for their book to bring to the publishing board (us) that will determine if we’ll publish these books (which, of course, we will). We’ll Skype with a fiction agent who will clue us in on the types of proposals that sell. This will give my students practice in understanding the how and why of decisions in a publishing house. We’ll hear from publishing professionals currently working in the field. When the manuscripts come back from the authors, each will go to a new group who will become the copyeditors. They’ll put the manuscript on a template, create style tags, and add front matter. Then I’ll probably have them transfer the work to a Google doc to make the copyediting process easier for group work. They’ll copyedit the manuscript and create a style sheet before preparing the manuscript for typesetting. We’ve got a plan to meet with a layout and design class. I’ve worked it out with the instructor to include an assignment for his class that involves creating book covers for our books. My students will fill out design acquisition forms and then present the stories of their manuscripts, audience, and other information to these designers so they have the information they need to create the covers. They will then work as teams to typeset the books and prepare final pdfs. The pdfs will then come back to our class and move to the next group that will then proofread. Final exam? We’ll learn how to take the manuscript and create an e-book. Will it work? I don’t know — my class will need to offer me some grace as we move through the process. The bottom line is that I hope they learn about the book publishing process, start to finish. On May 12, 2015, the writing world lost a great encourager, teacher, and mentor. At age 92, William Zinsser passed away. Author of the book that is (or should be) on the shelf of every writer and editor, On Writing Well, Zinsser left a legacy of helping people learn how to put words together. 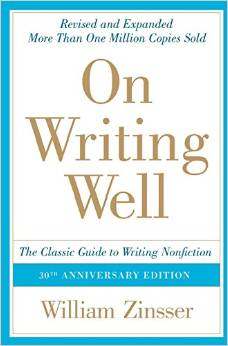 On Writing Well was first published in 1976 and has gone through seven editions as Zinsser updated it to take into account new technologies. The focus of the book is writing nonfiction, but the principles of good writing span all genres. Simplicity, economy of words, style, usage, voice, and understanding one’s audience are important for every type of writing–from the business email to the fantasy novel. Zinsser spent his career writing and teaching writing. During the 1950s, he wrote editorials and features for the New York Herald Tribune. In the 1960s, he was a freelancer, writing for the likes of Saturday Evening Post, Life, Look, and Sports Illustrated. The 1970s saw him at Yale University teaching nonfiction writing and humor writing. In the 1980s, he worked as editor of the Book-of-the-Month club, a mail-order book sales club that operated from 1926-2014. The remainder of his life he continued freelancing, writing eighteen books, and (of all things) playing jazz piano! But he’ll be most remembered and loved for what he did for helping writers understand their craft. There isn’t any “right” way to do such personal work. There are all kinds of writers and all kinds of methods, and any method that helps you to say what you want to say to the right method for you. . . . All [writers] are vulnerable and all of them are tense. They are driven by a compulsion to put some part of themselves on paper, and yet they don’t just write about what comes naturally. They sit down to commit an act of literature, and the self who emerges on paper is far stiffer than the person who sat down to write. Writing is hard work. A clear sentence is no accident. Very few sentences come out right the first time, or even the third time. Remember this in moments of despair. If you find that writing is hard, it’s because it is hard. . . . Writing well means believing in your writing and believing in yourself, taking risks, daring to be different, pushing yourself to excel. You will write only as well as you make yourself write. It’s not an easy life–this writing life. Those of you who have chosen to live your life with words–reading them, studying them, marveling at them, talking about them, writing them–you know this all too well. But it’s that moment when it all comes together, when we have written well, when we have committed an act of literature–it’s that moment that makes it all worthwhile. Thank you, William Zinsser, for your encouragement. I love this book and was so excited when I found it a few years ago. I go to it often and read excerpts to my editing class. Betsy Lerner created a product that helps writers understand editors and vice versa. 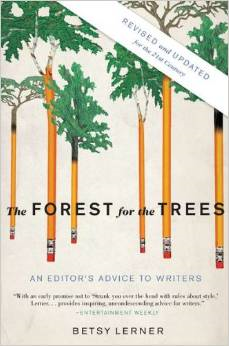 Titled The Forest for the Trees: An Editor’s Advice to Writers (Putnam, 2000, updated 2010), the first section of this book describes some general types of writers, and the second section peeks behind the editor’s desk and into the publishing world. Lerner knows wherof she speaks having been an editor for fifteen years before becoming an agent. She says, “This book is about what I’ve seen and what I know. I wrote it to help writers achieve or get closer to their goals. At the very least, I hope that in contemplating your life as a writer you may get some perspective on your work and in gaining that perspective, see the forest for the trees” (9). I teach my students that, as editors, they are working in tandem with authors–Betsy describes it as an intricate dance. The manuscript arrives on the editor’s desk. The editor will close the office door (or bring the manuscript home where she won’t be interrupted, she hopes) and sit back to read through the entire manuscript–either electronically or on hard copy. The scary red pen may be wielded–perhaps on the manuscript itself but certainly on a nearby notepad. She’s taking notes about first impressions–what’s working and what isn’t, what’s clear and what isn’t, when the pacing seems slow or a character seems out of place. She’s not correcting grammar or sentences; she’s seeing if the book in its entirety works. A good editor is careful. She needs to explain her point clearly and she needs to be respectful of the author. She knows that it’s never easy for an author to finally turn in a completed manuscript only to have it come back covered in comments and suggestions. Tell me about your experiences with editors. How have they helped your manuscript improve? One thing I’m discovering in my quest to sing the praises of the unsung heroes of publishing is that, too often, the unsung heroes like it that way. They’re quiet. They stay in the background. They enjoy the vicarious experience of watching their authors bask in the fame of a book that becomes a phenomenon. Chances are, you’ll know the name of the author, but the editor of said book? Not so much. Today meet Arthur Levine, the man behind the magic. He actually has his own imprint (Arthur A. Levine Books founded in 1996) within Scholastic. I just finished reading an interview with him in The Washington Post, published in July 2007 just prior to the release of the seventh and final book in the Harry Potter series, Harry Potter and the Deathly Hallows. Of course he, as editor, knew how the saga ended before the rest of us anxious readers. But he didn’t get caught up in the hype (well, he was thrilled, but he kept his focus in the right place). “I’m responsible for the books,” he says. As I wrote about with Maxwell Perkins and F. Scott Fitzgerald, we might not have had J. K. Rowling and Harry Potter if not for Arthur Levine. 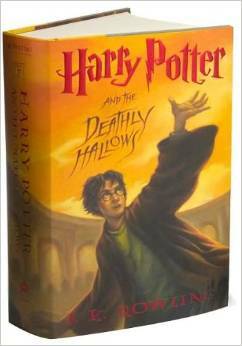 The Harry Potter series was first published in Great Britain by Bloomsbury Children’s Books, but . . . It wasn’t Bloomsbury’s responsibility to sell the U.S. rights to Harry. The company didn’t even own them. But when Levine showed up in Bologna seeking future classics for his new Scholastic imprint, Bloomsbury’s rights director gave him a set of Potter galleys. He read them on the plane home. When the book came up for auction, he kept bidding until, at $105,000, his last competitor dropped out. “I would have been willing to go further than that if I had to,” he says. Levine must have told this story a thousand times by now. But there’s still excitement in his voice as he describes how he got instantly hooked — “first chapter, first pages” — on Harry. I recall having the same feeling. I knew from the first page of the first book that I was in for an extraordinary ride–it was Rowling’s incredible writing that blew me away. Not just the extensive plotlines and characters and pacing and all of those things an editor looks for; it was her use of words. I remember how, when the first movie came out, and the camera pans into the great hall, I thought to myself, Yep, that’s it. That’s how I saw it when I read it. Her writing and descriptions absolutely astounded me. He [Levine] was as surprised as any ordinary fan, he says, by plot and character developments as they arose. Which is exactly how he and Rowling wanted it. . . . But Levine understands that aside from the hype and the merchandising and the trinkets and the Disney World theme park, it all comes back to where it started. With the books. Which, he maintains, are what’s driving the phenomenon in the first place. And that’s where all great editors land. No, they aren’t at the book signings. No one is chanting their name. No one is standing in line awaiting a copy of their book at the worldwide midnight release date . . . But for the great editors, that’s just fine. Great books are being put out into the world. My decision to use my blog to focus on the unsung heroes of publishing–the editors in the trenches–has sent me on an adventure of websites and book reading and rather intense study. But I am loving every minute of it. It’s just not all happening as quickly as my self-imposed blogging schedule might like. But I’m learning along the way about what makes great editors, and I want to pass what I’m learning along to you. In any case, my trail led me from Maxwell Perkins (see Part 1 and Part 2 of my homage to him) to Bennett Cerf (one of the founders of Random House publishers, more about him later) to Robert Loomis, legendary editor at Random House who retired in 2011 after 54 years. Right there. That should make him a hero. You’ve probably not heard of him. But chances are, you’ve heard of some of the people he edited, such as Maya Angelou and William Styron (Loomis edited Sophie’s Choice, among others). That’s the kind of relationship great editors have with writers. The writers need those editors. They love them. They entrust their works and words to them. They know those editors make them that much better as writers. As the article title says, great editors are nurturers of writers. But while the news accounts go to the authors and editors who pop from one publishing house to another, the less celebrated but more interesting tales are those of continuity and loyalty. Sometimes they even become the stuff of literary legend. Which brings us back to Ms. Angelou. Her editor is Robert Loomis, an executive editor at Random House, one of publishing’s hall of fame editors. “We are an item,” Ms. Angelou said. ”I would go with Bob if he left and went to a university press. He knows what I hope to achieve in all my work. I don’t know anybody as fierce, simply fierce, but he’s as tender as he’s tough.” . . .
Here’s an insight to a writer-editor relationship. Ms. Angelou said: ”He’s a nuisance. He asks these questions: ‘Why did you put a semicolon there, to give the thought some breath? Is that the word you really want?’ I’ve said to him many times you’re bullheaded, I’ll never speak to you again and then I send him night letters or telegrams telling him he’s right. 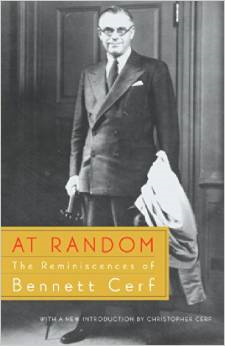 In fact, Bennett Cerf, co-founder of Random House (did you know they were so named because they printed “random” books? ), counted on the relationships his editors had with their authors to bring those authors into Random House and onto their publication lists. If Random House was able to lure an editor away from a competitor, often that editor’s authors came along. A good editor, I think, like a good author, has to be born with some of the necessary talents, like a good memory and some imagination. But he also needs to have acquired a fairly broad range of interests, a working knowledge of the English language and a good supply of general information–the more the better–so that he can understand what an author is trying to do and be of help to him in doing it. An editor has to have read widely enough to be able to recognize and appreciate good writing when he sees it. . . . Being a good editor means caring about books, caring about language, and being a constant learner. Being one of the greats takes perseverance, relationship-building, honesty coupled with kindness, and a big dose of nurturing. All of that because of a deep desire to help an author write the best book possible. So as it turns out, if it weren’t for an editor, there might not have been The Great Gatsby. I have decided that–while it’s terrific to review books and interview authors–I’m going to go a slightly different direction in my blog in the coming weeks. I’m going to study up on some great editors from the past, and I’m going to interview some great editors of the present. Because, well, I’m an editor. I know what it takes to work in the salt mines of editing manuscripts to make the good–the great–that much better. I know what it means to study typeset pages until your eyes cross, making sure no typos slip through because I want the author to look good. I know what it means to be in the background and let the author have the credit (as it should be). I just want to bring some of these people out of the shadows and learn from them and, in so doing, pass along some info to you, my readers, and to the students in my editing classes. After my last post about teaching editing, Rich Adin (who writes the blog “An American Editor“) commented, “We can teach people to be editors like me; we cannot teach people to be an editor like Maxwell Perkins. Perkins had that rare gift that made him the Michelangelo of editing.” Thanks so much for that comment, Rich, because that sent me on a quest to learn from the best. 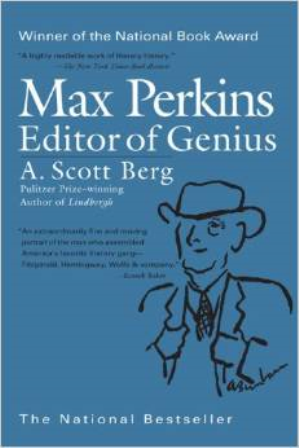 And that sent me to A. Scott Berg’s book, Max Perkins: Editor of Genius (New York: E. P. Dutton, 1978). Seriously, I’m so excited about what I’m reading I can barely stand it. Maxwell Perkins (1884-1947) was the editor at Charles Scribner’s and Sons for the likes of F. Scott Fitzgerald, Ernest Hemingway, and Thomas Wolfe. The book is filled with quotes from correspondence between Perkins and these writers and anecdotes of how he worked with them–cajoling them, encouraging them, offering insight and advice on the big picture of each manuscript, and advocating for them at the meetings of the editorial board. No, I will never be Max Perkins–and, no, I cannot teach anyone to be Max Perkins. The next Max Perkinses will arise from folks with that internal “gift” that is, simply put, God-given. But I want to learn from the best and pass along to my students what they, too, can learn from the best. And for my students out there–I tell you this all the time–you probably won’t start out as full-fledged editors. Max didn’t even study literature or writing in college (Harvard); instead, he studied economics. But his real love was words, and it was a freshman English instructor who, as Berg puts it, “certainly . . . developed Max’s editorial instincts” (32). After graduation, Max went to work writing for The New York Times as the writer who hung around all night and picked up the “suicides, fires, and other nocturnal catastrophes” (33). His first job at Charles Scribner’s and Sons was in the advertising department where he spent four and a half years before ascending to the hallowed fifth floor–the editorial floor. And, students, guess what he did there . . . But then here’s what happened. A regular Scribner author named Shane Leslie became friends with a young author from Minnesota. Leslie sent this young author’s manuscript to the editors at Scribner. It got passed from editor to editor (no one liked it) until it ended up on Perkins’s desk. While he liked it, he was forced to write to the author and decline it (the lowly proofreading editor didn’t have much sway at first). But Perkins saw something in the young man’s writing, and the rejection letter held out some hope and encouragement to the young man who went to work revising and revising and revising. The manuscript came back much improved, and Perkins went to work doing everything he could (and it was a lot) to get Scribner’s to publish it. At one tense editorial meeting, he said, “My feeling is that a publisher’s first allegiance is to talent. And if we aren’t going to publish talent like this, it is a very serious thing” (15-16). The young author was F. Scott Fitzgerald. The book was This Side of Paradise (Scribner’s 1920). What about The Great Gatsby? More on that next week. Suffice it to say, Maxwell Perkins is my new editorial hero. And I’m his newest student. Is It Possible to Teach Editing? I’m working on my syllabi for my fall classes. It’s always an interesting challenge. 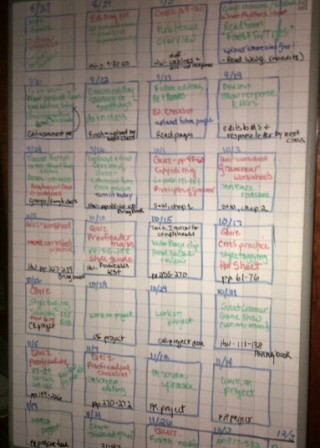 I like to use a white board–I can erase easily! Today I’m working on the syllabus for my Editing class for the sixth time. The first time I taught it, it was a marathon course (in a “special topics” category) where I had four Saturdays across the semester to get it all in. The next two times I taught it, it was a once-a-week evening class. Then, the next two times, it was a twice-a-week class. And now, for the first time, it’s a three-times-a-week class, with each class a mere fifty minutes. So as I laid out the skeleton of the syllabus yesterday with all of the dates (taking into account holidays), what started out as four classes is now thirty-nine classes. A part of me loves that. It feels like I have so much more opportunity to teach everything that is so important to editing. Editing …. is a craft, a skill. It is more than knowing an adjective from an adverb, a noun from a pronoun. It is more than being able to construct and deconstruct a sentence or a paragraph. We know that grammar and spelling are things that can be taught. Computers can be “taught” these tasks, even if they perform them rigidly and are unable to distinguish between “rain,” “rein,” and “reign” in context. But editing has an air of unteachability about it. True there are “editing” courses. But what is it that they teach? They teach the mechanics; they have to because it is not possible to teach one to be a good or great editor. If it were possible, there would be more great editors and fewer average editors. Editing is art with words. Every artist knows how to mix colors and how to apply paint to canvas, but few artists master the craft of art. Every generation produces a handful of Vermeers and Rembrandts and Gauguins; every generation would produce millions of them if the trick to their artistry could be taught. Editing is similar. There are many very good editors; there are few elite editors. Editing is a skill that can be nurtured and developed but which cannot be taught. Well, that just takes the wind out of my sails . . . but I have to partially agree. Editing is a skill, a craft, indeed it’s “art with words.” It’s a way of putting together a manuscript that takes it from ho-hum to grabbing you and holding you in page-turning mode (which is why, by the way, great editors need to be good writers and voracious readers). Here’s what I mean. Through the course of the class, I expose them to the three main types of editing and I let them know that these are very different skills. When we get to the end of the class, inevitably some have said they really like the big-picture editing, but proofreading–not so much. Others hated proofreading because they couldn’t, at that point, make any (or many) changes to the typeset pages; they preferred copyediting where there was still opportunity to improve the sentences. One or two may go out of my class realizing that they hate editing, it’s not in their “genes” (as one comment on that blog put it)–and that’s a good thing. College should be helping you sort out what you like and don’t like, where you’re gifted and where you’re not. So can it be taught? I’d like to think it can–at least, what I teach are the basics that help my students find that sweet spot, that hot button, that then sends them on their own trajectories. If they love it, they’ll work to further develop that skill on their own. After all, the great elite editors all started somewhere. I’m hoping a few of them start out in my class. Find me these other places!